It’s been several months and I finally confess…I’m a yogurt-holic and I need help. Truth to tell I’ve never been terribly fond of yogurt and I always thought that yogurt was too high in carbs for me. In fact, last year I was on a family trip to Greece and I had pooh-poohed the tour guide who swore he lost weight eating Greek yogurt. I repent now of abject ignorance that Greek yogurt is only about 4g in 100 g, because most of the carbs are in the whey which is drained away as part of the yogurt making process. I may still have continued in sheer ignorance of not for various ones raving about how wonderful Instant Pot yogurt tasted. And now I am such a convert. I started making yogurt with a cold start method, which is pretty much just getting organic ultrapasteurized milk and mixing it with the starter and putting it on the yogurt mode in the Instant Pot. Easy peasy. But truth to tell, organic milk is horrendously expensive in Singapore (about USD$12 per 2L carton). So unless it goes on sale, I make do with the traditional boil method that is used for regular pasteurized garden variety milk. It’s not that much more difficult but adds in approximately 30-45 minutes of time to bring the temperature to 80 deg C (180 deg F) to kill the nasty germs and cooling it to a temperature that allows you to add the starter without killing all the good lactobacillus. So I’ve been stalking batches of organic ultrapasteurized milk in the supermarkets – I think I’ve got the cycles down pat – roughly a week before expiry, the milk goes at half price or even less. That’s when I swoop down and activate a bunch of likeminded friends to head to the supermarket to get our cheap organic milk. But after a couple of times doing the traditional boil method I’ve gotten over my phobia of the scalding and cooling process and I’ve become somewhat resigned to using regular milk. The taste is still remarkably good, and somehow Instant Pot yogurt beats storebought yogurt hands down for the creamy mouth feel. So anyway although I now use regular milk to make yogurt with the traditional boil method, that hasn’t quite cured me of the instinct to check out the supermarket every so often for the wonderful discount red tag. 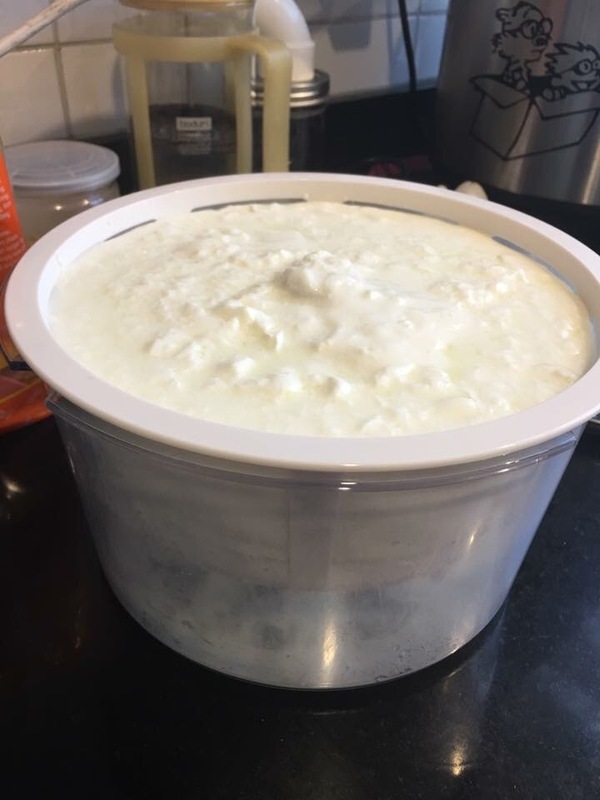 So why do I seem to be making so much yogurt? I guess it’s because somehow I’ve gone off eating eggs for breakfast – yes it’s been a really nasty couple of weeks where I’ve had to rush out of the house at the crack of dawn, with barely enough time to get ready, let alone eat a hot cooked breakfast. So the yogurt is already portioned into little containers that I dump some berries or sugar free syrup into and it is a great breakfast that can be eaten on the go (or in the car at traffic lights…). Kid #1 is also a big fan of the yogurt. He’s doing his national service at the moment and because of a much higher level of exercise, sweeps through the house like a vacuum cleaner late at night when he gets home. It’s frightening how much food disappears in his wake. So the yogurt is happily there in the morning so that he won’t be whining about why there’s no more food left in the house. I included a simple strawberry compote recipe below. It is great with fresh or frozen strawberries and the same base recipe can be used for other berries like blackberries or raspberries. And of course if the yogurt can’t be finished fast enough (hardly ever happens in my home), yogurt pops or icecream are great ways to use up and freeze yogurt. All Day I Dream About Food has an amazing blackberry and sage yogurt ice cream that I’ve made a couple of times and can swear by how awesome it is. So of late, yogurt-making has become a really simple production – I usually do the cold or hot start method at night after dinner, do the yogurt cycle for about 9 hours overnight, them drain the yogurt in the fridge the next morning. There is always a sense of excitement opening the lid of the pot and seeing the solid yogurt in the morning. 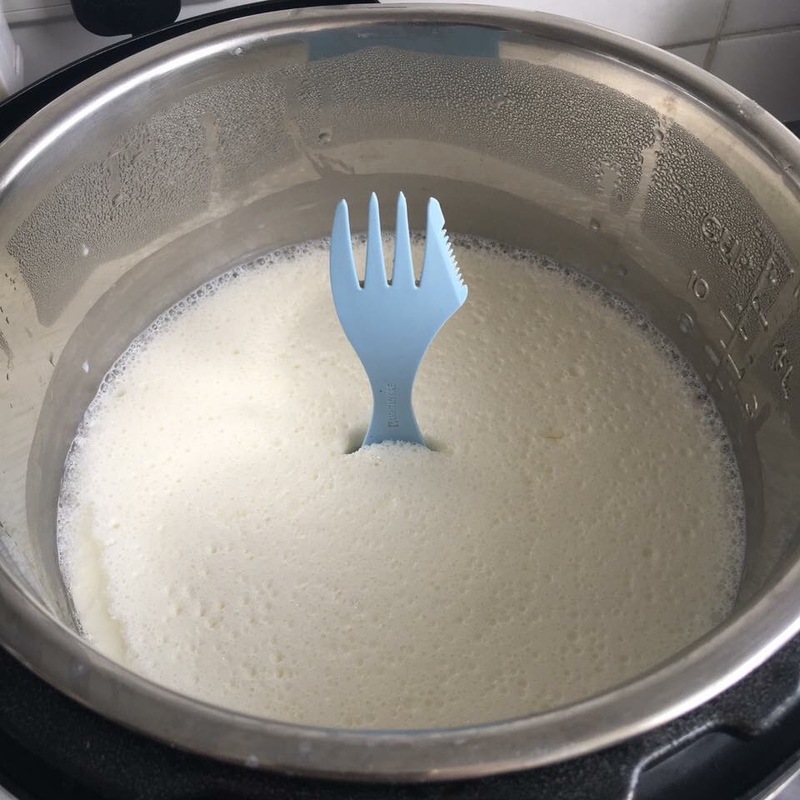 The spork salute test – what a fellow Instant potter and I call the test of success and thickness of yogurt. I used to drain the yogurt in the fridge with a muslin cloth lining a sieve but I’ve now graduated to using a yogurt strainer which is neater and takes up less fridge space. And finally the yogurt is also a great standby in the fridge for times I need something like sour cream to go into a dip or with meat dishes like pulled pork. 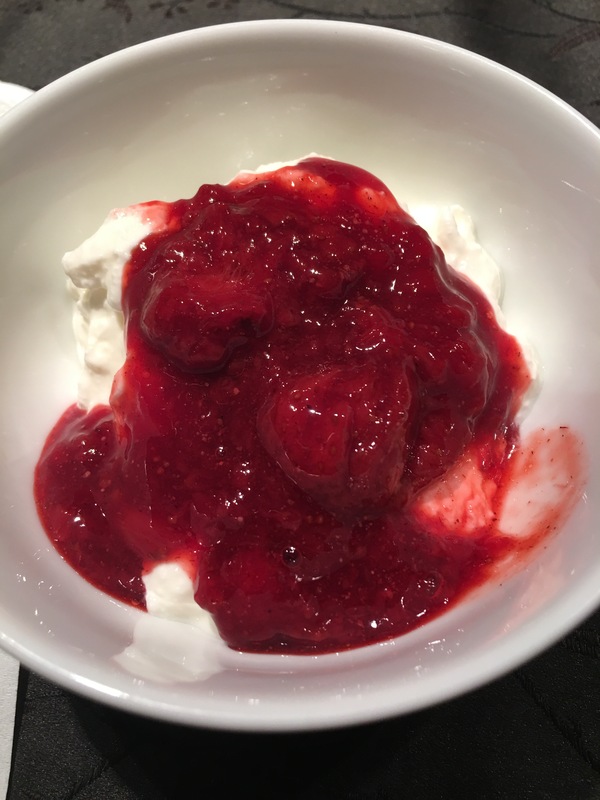 Making yogurt in the Instant Pot has transformed my life and it looks like something that will be a staple in my home for the long run. Steam heat the Instant Pot and utensils (I usually place a trivet, whisk and spoon into the pot). Put 2 cups of water into the inner pot. Place the whisk and spoon on top of the trivet. Seal the pot and put on steamer mode for 10 minutes. When done, open the pot and remove the sterilized whisk and spoon and discard the water. Put the inner pot back and allow all these to cool for about 15-20 minutes. Pour the milk into the inner pot. Add the yogurt starter and whisk it in well. Cover the pot and put on yogurt mode for 9 hours. When done, drain the yogurt over a sieve lined by muslin cloth. Cover and drain in the fridge for 3-4 hours. Set aside 1-2 tbsp yogurt to be the next starter. Freeze this portion. Keep the rest of the yogurt in the fridge till ready to use. For the strawberry compote, place the strawberries, Cointreau, sugar substitute and nutmeg into a saucepan and heat over low heat for 5-10 minutes, stirring occasionally and allowing the strawberries to soften. Mash the strawberries slightly with a spatula. Sprinkle the xanthan gum over the compote and stir very well. When thickened, turn off the heat. Stir in the vanilla. The compote can be served warm with the yogurt or chilled till ready to use. Serve the yogurt with the compote on top.